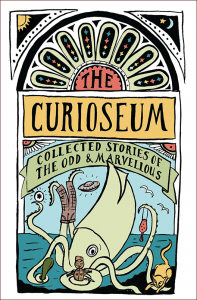 The Curioseum – creating a curious collection! Several years ago I had this idea – that you could ask a bunch of very good writers to Te Papa, show them around some of the weird stuff in the museum collections, then ask them to write an entirely fictional piece around one object that they chose. Working at Te Papa, I knew some of the really strange objects hidden away in the back. When I finally took this idea to Claire Murdoch, publisher at Te Papa Press, she’d had exactly the same idea! So clearly its time had come. The project was a collaboration between the Whitireia Creative Writing Programme and Te Papa Press. I was working for both institutions – which was very helpful! – but for this project I was wearing my Whitireia hat. We wanted the writers to be a diverse and surprising group, a mix of poets, script writers, journalists, graphic novelists – some well-known as children’s writers, and some not known as children’s writers at all. We invited them all to the museum, they spent the day with collection managers and curators looking around some of the collections – then off they went to write a fantastical or funny or clever or serious piece for 8-12 year olds. I was the editor for this book, and this is when the real work started! It was a big editing job. If you don’t normally write for children, it might take a lot of rewriting to hammer your great idea into shape for that age group. And we were discovering how to make this totally new concept work. But working with this good-humoured, patient, professional group of writers was a great pleasure – though I’m sure rolled their eyes at me once or twice! And in the end it all came together. Sarah Laing’s whimsical illustrations knitted these very diverse pieces into a unified whole, and we launched it in March 2014 with readings, writing workshops for kids, and a museum sleepover. How lucky to be part of a project like this. And I like to think that kids will read it and look at their local museum with entirely new eyes – like, where could that hat or piece of rock really have come from?